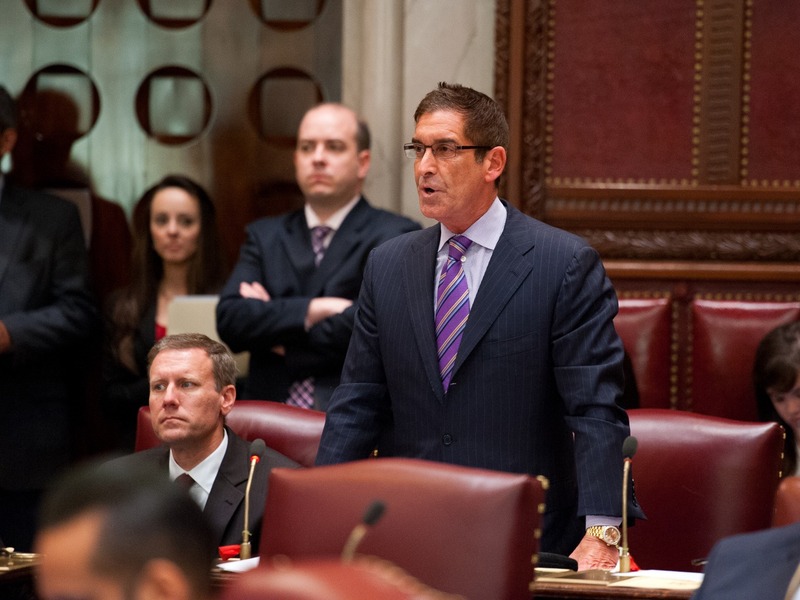 Rising from his red leather chair in the gilded New York state Senate chambers, state Senator Jeffrey D. Klein stood near the apex of the semi-circled seats of the upper house. It was January 8. He had the floor. His allies in the Independent Democratic Conference flanked him, gazing up to him, comfortable in their thrones. In most cases, they owe their unique political power to him. Their loyalty to his breakaway group gave them stature, influence and money. Just under his nose, mere feet away, were the mainline Democrats, whose leadership Klein rejected in favor of his own cross-party power-sharing agreement. To his right were his allies, the Republicans, his coalition partners. Klein has accomplished what few thought possible just seven years ago, an unprecedented political reality. He stands astride a partisan chasm, brokering deals for progressive legislation with conservative lawmakers. In a moment of vicious partisan rancor and obstructionism nationally, he and his IDC are an anomaly—a cause for celebration to some, a cancer to others. The 57-year-old senator from the Bronx took his notes from a file folder with a world map printed on the side. His suit was sharply tailored with a purple tie, his skin was bronze, his hair was coiffed and trim. At least from the gallery, it appeared that as he spoke, the strength of his office, the sheen of appearance, and the determination of his words belied a hint of uncertainty and discomfort. Jeff Klein is a political genius, his enemies and allies agree on some variation of that. But that brilliance comes wrapped in ever-present dichotomies. He’s an adoring son and brother, but he doesn’t like to be touched. He’s a Democrat but he’s allied with Republicans. He’s a man whose favorite movies include “It’s a Wonderful Life” and “Kill Bill.” He has a long-term girlfriend, but calls himself single. He’s a fitness buff who smokes. But his tactical acumen and maze of contradictions lie beneath a carefully crafted exterior that can be distracting. He wears designer suits. He drives an “executive class” Mercedes. His left wrist carries a golden Rolex perhaps worth $10,000 and a diamond adorns his right ring finger. He has a blazing white smile with flawlessly straight teeth. He has deeply tanned skin, from what one tanning salon called “once-a-week” visits, and his haircuts have cost in the “high hundreds,” a Senate source said. His smile can evoke both playful malice and an aw-shucks awkwardness while his eyebrows can form striking gothic arches. Don’t mind Klein’s outer skin, just be wary of his skill, say current and former New York legislative staffers and lawmakers who have worked closely with him. Klein is a chess master, when so many others in Albany are just playing checkers. But tactics are only one element of his political survival. The engine of his success is obvious, even to a casual observer. “Nobody works harder,” Klein says with a grin, stating his personal motto. He wakes up at 5:30am and meets his personal trainer at a gym above a Jiffy Lube in the Bronx. He’s back home by about 6:45am reading the print papers cover to cover, then the online news clips prepared by his staff. He obsesses over details, personally crafting bills, tweaking constituent response protocols, consuming books and rarely resting. He seems always ready for action and always talking politics. He is a one-man perpetual motion machine, who once mused: What it is that people do after they clock out at 5pm? He, his family, friends and allies all say with reverence that he does it “for the people.” His enemies, of course, say his motivation is less altruistic and more primal. To them, Klein is driven by power. In his more than 20 years of public service, Klein has been accused of many things and challenged by critics in politics and the press. He took businesses’ campaign contributions and passed laws that will benefit those businesses, one report said. He directed $100,000 in pork barrel spending to create a plaza that already existed, another story reported. A particularly damning piece stated that “Klein has gamed the system—and possibly broken the law—for years, thumbing his nose at city zoning regulations, getting tax breaks he isn’t entitled to, and failing to disclose his assets to state officials.” And another blasted the “turncoat Democrat” for his “$1 million staff” allowance. All those stories featured the byline of onetime New York Post reporter Candice M. Giove, arguably among Klein’s dogged skeptics. That is, until Giove left the Post in October 2013 and Klein hired her in January 2014. Just months after she upbraided him as a traitor, she was drawing a paycheck from that million-dollar ledger. Today, Giove is Klein’s communications director who journalists in the Albany often see as Klein’s fearsome shadow, in lockstep with the IDC chief, tearing into journalists that dare to criticize her boss. And so, when the latest allegations of wrongdoing erupted this January, with a former IDC lawyer accusing him of forcibly kissing her in 2015, a student of history might be left to wonder if this scandal will be any different from his last. Whether this or any other allegations are true or false, surveying Klein’s decades in New York politics, you have to admit it: At least up until now, it seems nothing can stop Jeff Klein. In the moments before Klein gave his opening address to the state Senate, the words of state Senator Andrea Stewart-Cousins’s remarks echoed through the chamber. The Democratic Senate minority leader’s impassioned speech decried the scourge of sexual harassment in Albany, even wearing all black to signify her solidarity with victims of sexual abuse. In fact, Governor Andrew Cuomo, Assembly Speaker Carl Heastie and Senate Majority Leader John Flanagan—every key political leader, it seemed—had used part of their opening address to denounce the hot-button issue and demand reform. Everyone, that is, except Klein. Klein spoke of the IDC’s ambitious budget agenda—student debt relief, addressing a doctor shortage in rural areas, fixing a New York City subway system in chaos, voter reform and generally protecting the state’s hard-working taxpayers—but not a word about the issue that would soon dominate coverage of him in the headlines. What few knew was that a HuffPost reporter had contacted Klein’s staff four days earlier to describe allegations that an IDC staff lawyer said he grabbed her and stuck his tongue down her throat outside of a bar one night in Albany. The story would post soon. It was Monday. Two days later, at 3:36pm. on Wednesday, Giove fired off an email to members of the Albany Capitol press corps, excluding HuffPost. Klein would break the news himself and frame the narrative. “The reason for this call is that a former IDC staffer has made a serious allegation to a Huffington Post reporter…This staffer alleges that on the night of March 31, 2015, the night that the 2015 state budget passed, I forcibly kissed her outside of a bar where staff members were celebrating. I want to be crystal clear, this alleged incident never happened,” Klein told reporters. Klein and Savino played up chummy banter with the reporters, calling them by name and asking how they were doing. After the questions were asked and reporters began hanging up, a moderator announced the call was over. But a hot mic in Klein’s office picked up a few final words. “Was that okay?” asked Klein. A male voice responded, “Yeah, all the Twitter traffic was–” Two beeps sounded and the line went dead. Thirty minutes later, HuffPost had its story up. Erica Vladimer, the former IDC lawyer, went on the record describing her account of what happened that evening. The story consumed Albany. 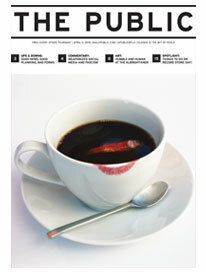 Perhaps the state capital’s #MeToo moment had finally arrived, editorial boards opined. When lawmakers first returned to Albany the week before, the question had been whether Klein would really rejoin the mainline Democrats: Will he do it? Now, in the wake of Vladimer’s allegations, it had shifted: Did he do it? Even asking the question became a political act. The governor promised an investigation. The state Senate declined to investigate. Klein welcomed an independent inquiry and has since confirmed the Joint Commission on Public Ethics is investigating. In the absence of immediate answers, the questions surrounding Klein beg larger ones about the way he conducts himself: How well do we really know this powerful man? At the back of a dimly-lit Italian restaurant in the Bronx, Klein ordered the chicken parmesan. The waiter turned to leave. Klein stopped him. “Pounded thin,” he said, narrowing his fingers high above the white tablecloth, in a pincer motion. It was a cloudy afternoon in October, months before Klein would be engulfed in scandal. Patricia’s used to be little more than a neighborhood pizza shop, Klein said, but now, with its white tablecloths and imposing artwork in thick elaborate frames, it held a certain grandeur. A heavy mirror hung to Klein’s left, coating the wall in a dark reflection. A giant chandelier cast light from the center of the room to Klein’s corner table. “How many leaders are bachelors?” I asked. “She’s my girlfriend, but we’re not married,” Klein said. “That’s what I’m saying! You’re single by tax status,” Giove prodded, hinting at his 10-year relationship with fellow IDC ally Senator Diane Savino. “Oh, okay, right. Okay. Right, Okay,” Klein retreated. “Diane would be offended,” Giove offered. Leaving the restaurant, Klein continued on the tour of his district we had begun early that morning. He had selected three schools, two senior centers, a NYCHA tenants’ meeting, a marina, and an anti-hate forum to showcase his swath of northern New York City and Westchester County. It was a breakneck pace, with the senator traveling separately in his glossy black SUV with an assistant and his press team trailing behind. Klein doled out an oversized check to a musical theater group, chatted with grade schoolers about their future careers, and glad-handed adoring octogenarians. By appearances, he was a beloved figure. Even Koppell says Klein does a pretty good job of taking care of the people in his district. “I think he’s pretty good at potholes,” Koppell said. Klein knew he was headed for elected office long before that. The sixth-grade teacher who taught Klein civics remembers the aspiring power broker. “He was a deliberative, thoughtful type of kid,” said Ron Imundi, now 71. But at 12 years old, Klein hadn’t grown a tough outer shell. “He was a cuuute looking kid. He was a nice-looking, smart kid,” Imundi said. Jeffrey’s sister Lisa is two years younger. She always admired her big brother. “Very personable, very outgoing, very ambitious—even back then,” she said. When she was bullied on the way home from school one day, her 10-year-old brother noticed she was upset and ran back to confront the kid. “He said, ‘Don’t even think about starting with my sister. I watch over her!’” Lisa remembered. “We would always be together as a family, always,” Lisa said. That holds true today, she said. “If it’s not family vacations, we text often and we speak as much as we can, several times a week.” Her sons look up to Klein as a role model. And for a boy who would grow to cultivate an urbane, tidy persona, Klein always had an apparently incongruous affection for the wild. “He would collect snakes and he was into all those reptiles,” laughed Lisa, remembering her brother at age 10. “He had a passion for that.” And he still does. Klein has kept lizards and turtles as pets throughout his legislative career. But Klein wouldn’t ultimately make a living getting his hands dirty. When Jeffrey and his sister went to visit their father in his shop after school, he would say to Jeffrey, “Maybe you want to go into business,” Lisa recalls. The machine shop was a family business that Klein’s father ran with his brother and his father, who emigrated from Poland. His mother’s father was a butcher from Hungary. A career in sales or a trade would have been only natural. Klein would go on to be the first college graduate in the family, graduating from Queens College in 1983, adding a master’s degree from Columbia’s School of International and Public Affairs in 1985. By then, he had already caught the eye of Democratic political operative John Sabini, who would become a New York City councilman and state senator. Coordinating a re-election project for then-Mayor Ed Koch in 1984, Sabini noticed Klein as a diligent young volunteer from the Bronx, who readily worked late nights and weekends. When Sabini began working for Rep. James Scheuer, he got the hardworking kid from the Bronx hired. In three years, Klein rose to become Scheuer’s chief of staff and started climbing the ladder of local politics. Klein displaced a long-serving Democratic committeeman in 1988 and became district leader in 1990. During that rapid political rise, Klein married a young lawyer named Beth. But while his political career soared, the marriage fell apart. Klein went on to CUNY Law School and gained admittance to the bar in 1994. Klein would work for Trolman, Glaser & Lichtman from 1994 to 1995 and later operate his own firm from 1996 until 2015. At Trolman, Glaser & Lichtman, Klein said the partners asked him not to leap into politics. But Klein was determined to take a shot at a legislative seat. He would have to challenge the Democratic machine to get it. Bronx politics was often carefully choreographed in the 1990s. In 1994, Assemblyman George Friedman sponsored a bill creating a new state Supreme Court judgeship in the Bronx. As chairman of the Bronx Democratic Party, Friedman oversaw the nominating convention where he was named the party candidate, a sequence of events all but ensuring his election, a New York Times editorial bemoaned. Given the timing, it also left his Assembly seat vacant after the primary, leaving the choice of nominee to the local committee. “Those are usually closed affairs and boss controlled,” Sabini told City & State in a recent interview. Klein was not the heir apparent. So, Klein did what Klein does best. When the committee voted on the nominee, Klein won. His challenger didn’t know what hit him. Klein’s passion for politics spills into all areas of his life, blurring the distinction between what is personal and what is political—he is dating a fellow senator, after all. But a closer look at a different relationship helps show how symbiotic those worlds are for Klein. Albanian-American real estate developer Mark Gjonaj says he first met Klein in the early 1990s, at the dawn of Klein’s legislative career. Gjonaj served as a liaison to the area’s ethnic Albanian enclave and a conduit to the city’s politically powerful real estate community, former state Senate staffers say. At some point, Klein and Gjonaj became fishing buddies and “social friends,” Gjonaj said. Gjonaj, however, was a stalwart Republican supporter, doling out contributions to longtime incumbent state Senator Guy Velella while he was being investigated for corruption, and well after he was indicted for it—Velella eventually pleaded guilty to bribery conspiracy. Klein promised to support Koppell at first, but never followed through in any way, said Koppell, whose husband, G. Oliver Koppell, later ran against Klein. Velella won that election, but when he entered a guilty plea in May 2004, during the runup to that year’s election, Klein was there to capitalize by running. Two months before, Klein had decided to buy a new house. On March 23, 2004, he signed a deed to pay Gjonaj $500,000 for a property that Gjonaj had purchased for $280,000 the previous June. City records show no major improvements were made to the house during that time and market value estimates place the property at $299,300. Alan Blass, a forensic accountant and former deputy chief investigative auditor for the New York City Department of Investigation, finds the transaction suspect. Blass cited two elements that make the sale unusual: The fact that the sale price was so much higher and the fact that Gjonaj did not do it through his real estate business. By buying and selling the house in his own name, he would pay more in taxes, Blass noted. Gjonaj’s spokesman said not to read too much into the transaction. “Mark originally purchased the home for his family but ultimately decided to list the property for sale on the open market. Jeff Klein purchased the home,” said Gjonaj spokesperson Reginald Johnson. Gjonaj also made minor improvements, he noted. Klein’s spokesperson Giove also shared mortgage documents that show the house was appraised privately for $550,000. Further, Giove denied that Gjonaj and Klein were even friends at the time, and said that Klein worked with a real estate agent and was not in direct contact with Gjonaj about the purchase of the property. It remains unclear how the home’s sale price increased by 78 percent in under a year. The record shows Klein and Gjonaj went on to boost each other’s political fortunes. Although, Giove notes, not exclusively. Klein supported Gjonaj’s 2012 Assembly race opponent Naomi Rivera and Gjonaj did make a $500 donation to Velella, a Republican, after the sale, in May 2004, she said. Beginning in 2006, however, Gjonaj and his family gave $9,500 in campaign contributions and have remained stalwart supporters of Klein. Most recently, Klein helped muster support for Gjonaj’s New York City Council election, with Gjonaj’s campaign raising and spending far more than any in city council history: $1.3 million. Klein, former state Senate staffers note, has long been a friend to real estate interests, well beyond his relationship to Gjonaj, and the real estate lobby has been very good to him in turn. A breakdown of Klein’s campaign contributions by broad industry shows that real estate is by far his largest industry donor, having given $1.2 million from 2000 to 2016, according to data collected by the National Institute on Money in State Politics. In 2017, the Real Estate Board of New York’s political action committee alone gave $15,000 to Klein and $100,000 to the IDC’s campaign fund—the PAC’s largest contribution that year, according to state Board of Elections filings. REBNY gave a further total of $41,000 to other individual IDC members, which adds up to $156,000, or more than a quarter of the PAC’s contributions last year. A significant amount of these campaign contributions were spent on food, which seems understandable for a man who is always talking shop. Nevertheless, last year’s restaurant bills were impressive. Klein spent $44,000 at restaurants, compared to Republican Majority Leader John Flanagan’s tab of just $7,787, according to the New York Post. But Klein’s defenders said that he’s nothing like the leaders that his power-sharing coalition supplanted when a series of corruption indictments rained down on Albany over the last decade. Klein is indeed very different than the fallen leaders who left him standing atop the Capitol’s power structure. But he was there when they fell and he knew them well. In short order, Klein became the deputy minority leader, took over the Senate Democratic Campaign Committee and raised millions of dollars. Come 2008, the Democrats went from being behind by six seats to taking a two-seat majority in the state Senate for the first time since 1964. Spirits were high and visions of legislative victories filled party leaders’ speeches. Reality was not kind to the optimists. And at that time, Klein was not a top Senate leader—not yet. That year, the party gave him the unenviable task of wrangling a rebellious group of four senators – Espada, Kruger, Hiram Monserrate and Ruben Diaz, Sr.—who rejected Democratic leader Malcolm Smith and keeping them in the Democratic fold. As it turned out, with the exception of Klein and Diaz, every one of those men would be found guilty of a felony within six years. “One of the worst things that happened was the coup with Pedro Espada,” Klein said, referring to the parliamentary maneuver Espada used to unseat Smith. “I still fought on and wanted to keep the (Democratic) majority, it was very, very difficult.” And fleeting. Republicans took back the state Senate in 2010. The Democratic leadership stripped Klein of his role as party strategist and he resigned the deputy minority leader post. “I started thinking about some type of coalition or a better way to work between both sides of the aisle about a year after the coup,” Klein said. But seeing senators he’d worked so hard to elect in traditionally Republican districts meet defeat in 2010 hit him hard. “These were solid people and took a risk and won seats that were Republican seats,” Klein said. The Democratic leadership failed to appreciate their politically precarious positions. The party needed better leadership, he thought, and an independent conference was needed. He wasn’t the only one who thought so. A core group of breakaway Democrats—Klein, Savino, state Senator David Valesky and state Senator David Carlucci—would go on to form the Independent Democratic Conference, or the IDC. “The hyper-partisan gridlock that we see in Washington virtually every day of the week, that’s what New York was like,” Valesky told me during a recent interview in his cavernous corner office in the Capitol building. “I don’t think it’s necessarily tacking to the middle. It’s knowing what you’re able to get done and what you can’t,” Klein said. He and Cuomo are similar that way. “He’s very results oriented, I’m very results oriented,” Klein said. “If he can have someone work on the Republicans to be more focused on core Democratic issues like the $15 minimum wage, like paid family leave, like Raise the Age…” Klein said, listing his accomplishments. Looking at the more than 60 signed bills posted like trophies on the wall of Klein’s conference room, just a few dozen paces from the Republican majority leader’s office, even a diehard party loyalist might be left wondering if Klein has a point. But in the era of President Donald Trump, calls for party loyalty have grown to a frenzied pitch among grassroots progressive activists. Groups like True Blue NY and NO IDC NY have a stated goal of attacking Democrats who aren’t liberal enough. The IDC is near the top of their list for breaking ranks with mainline Democrats and sharing power with the Republicans, but there’s another New York state senator on whom Klein would have them focus their ire. Senator Simcha Felder is the man who truly tips the balance of power in the Senate towards the Republicans, Klein says. Felder, a political curiosity, ran successfully on the Democratic, Conservative and Republican lines in the past election. At the moment, with two Democratic seats vacant, the current Senate math works out to 21 mainline Democrats, 31 Republicans, 8 IDC members, and Felder. Even if the IDC and Felder switched teams to align with the Democrats, the Republicans would retain the majority 31-30—at least until special elections in April. But Felder, technically a Democrat but really an unapologetic party heretic who caucuses directly with the Republicans, admits that he and Klein don’t interact much. “I think everyone would agree that the reason that it hasn’t changed is because of personality disagreements between some of the leadership of the Democratic caucus and the IDC,” Felder said. While there are long-simmering tensions between Deputy Democratic Conference Leader Senator Michael Gianaris and Klein—although they once enjoyed each other’s company in adjacent Assembly seats—many political observers argue that Cuomo could put an end to the IDC’s rebellion if he decided it was worth the political capital. Considering Cuomo’s presidential ambitions for 2020, he may be deciding just that. Over the summer, there were reports that members of New York’s congressional delegation had chastised the governor for allowing the IDC to persist, followed by more reports rippling through Albany that Cuomo was trying to reunite Klein’s conference with mainline Democrats, perhaps to appease those who will anoint the party’s next presidential candidate. The first reports of IDC primary challengers surfaced in October, when a press report named Alessandra Biaggi as a potential Klein opponent. And for those who see the governor’s fingerprints on the backside of every political transaction, there’s an intriguing conspiracy theory. Stringing together the timeline of key events surrounding Biaggi’s candidacy, her ties to the Democratic establishment, and the breaking news of the sexual harassment scandal, there’s a slew of coincidences. On December 28, Biaggi bought the domain name for her campaign website at what would have been about the same time Erica Vladimer said she told state Senator Liz Krueger, a Democrat, that she was coming forward with the allegations that an unnamed lawmaker forcibly kissed her. On January 2, Biaggi registered as a candidate. On January 4, the HuffPost contacted Klein about Vladimer’s allegations. On January 6, Biaggi paid for a website template and the site went live on January 9, Biaggi said. On January 10, the scandal broke as Klein hosted the conference call with reporters and the HuffPost published its story. The next day, on January 11, Biaggi launched a social media campaign, making Vladimer’s sexual assault allegations a central part of her political attack. Now, consider that Biaggi’s previous employer was Cuomo, and before that Hillary Clinton, and before that Joe Crowley. Coincidence? “Yes,” said Biaggi earnestly. “Literally, not one person on this earth…nobody, no one” told her in advance about the Erica Vladimer story, she said. It was simply luck of another order. Perhaps it was preordained? “Those are your words,” she said, laughing. As she spoke about Klein, the 31-year-old lawyer’s buoyancy dissipated, giving way to cutting words. She has no appreciation for his politics, and no respect for his power-brokering with Republicans. “He’s not a diplomat. He’s a traitor,” she said with ice in her voice. “And it’s time to bring light to that.” Her campaign does not have the institutional backing of the Democratic Party, she admits, or the $2 million war chest Klein currently holds. Still, she noted with quiet confidence, she will raise money and fight on. “There are other important endorsements that will make this fight winnable,” Biaggi said coyly. Back in October, the news of Biaggi’s likely run seemed like little more than an annoyance to Klein. To date, a majority of the IDC members will have primary challengers. But for Klein in particular, the sexual assault allegations may pose a vexing political challenge as the September primaries loom higher on the horizon. There’s a broader cultural calculus afoot in the #MeToo movement which has toppled the careers of U.S. senators—why not a New York state senator? A dozen former and current lawmakers, legislative staffers, and others who have spent time with Klein all agreed that they were unsure if the allegations were true or not. Anyone is capable, many said, even as they noted that they had never witnessed any similar behavior from Klein. Two elements of Vladimer’s account stuck in people’s minds. The first was that she immediately told a friend at the time. The second was that so few people would lie about something like this because, they reasoned, what do you really have to gain? Kathleen Peratis, a lawyer specializing in sexual harassment cases for law firm Outten & Golden, agrees with those instincts. Until JCOPE issues its findings, at least, Klein’s political fate appears secure. With no shortage of political foes who continue to scrutinize his 30 years of political gamesmanship, where has he slipped up? I asked Klein back in October, what he considers to be his biggest mistake. “Mistake?” Klein said, a bit thrown. I kept it broad: Anything between now and fifth grade? He paused again and squinted. Frank G. Runyeon is senior reporter for City & State, a politics and policy journal with which The Public shares content.